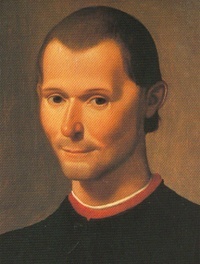 Il Principe (The Prince) is a political treatise by the Florentine public servant and political theorist Niccolò Machiavelli. Originally called De Principatibus (About Principalities), it was originally written in 1513, but not published until 1532, five years after Machiavelli's death. The treatise is not representative of the work published during his lifetime, but it is the most remembered, and the work responsible for bringing "Machiavellian" into wide usage as a pejorative term. It has also been suggested by some critics that the piece is, in fact, a satire. Discouraged by the Catholic "Index"
Unless indicated otherwise, the text in this article is either based on Wikipedia article "The Prince" or another language Wikipedia page thereof used under the terms of the GNU Free Documentation License; or on original research by Jahsonic and friends. See Art and Popular Culture's copyright notice. This page was last modified 12:07, 3 May 2009.